Enemies: Albion (Bran Bardic) of Earth-70518, Captain Britain Corps, Alison Double, Betsy Braddock, Captain Britain, Captain U.K., Exiles (Blink-295, Morph-1081, Sabretooth-295, Thunderbird-1100), Fury, Merlyn, Roma, Saturnyne, Tom Lennox, Vixen. Aliases: The Crooked Man; Lord Jim is likely. Base of Operations: Number 10, Downing Street, London. Powers/Abilities: Able to change reality with a thought - virtually limitless ability. Even destroying the reality he was in would not have killed him. Apparently, he briefly existed in a powerless form (or else some kind of copy did). He reformed from nothingness seemingly amalgamated with the Fury, and presumably possessing some of its abilities. 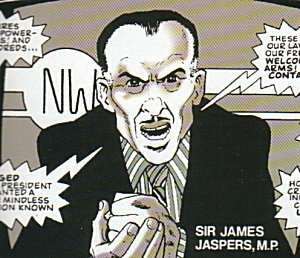 History: (The Daredevils#7) - As reported in The Guardian, Sir James Jaspers, Conservative member for Haslope West, made a call in the House of Commons for strict disciplinary measures to be brought in to deal with superhumans active in the British Isles. 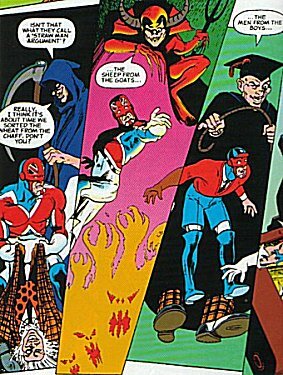 (The Daredevils#9) - Sir James continued his campaign by making a speech on television: "They are clandestine, they are frighteningly powerful, and they are not our friends. They have walked among us for more than forty years, robbing us of independence and endangering our lives...and they call themselves superheroes! America is overrun with them, they have established footholds in Canada, Africa and the Middle East. Even Russia has not proven immune. Many of the creatures are individually as powerful as entire armies! And they number in hundreds...hundreds! We have encouraged them! Last month, President Ronald Reagan granted a full pardon to the mindless engine of destruction known as the Hulk. These monsters ignore our laws and threaten our freedom, yet we welcome them with open arms! They must be contained! But how? How do you contain a being that can uproot mountains or walk through walls? How do you reprimand creatures that are indestructible, that can bend the very lightning to their will? How do we suppress the supermen? But let them know this...Impregnable though they may be, humanity is aware of the menace they pose. We have closed our ranks against them and we stand determined...waiting to see who will make the next move." The speech was word for word identical to the one made by the James Jaspers of Earth-238 before he launched his crusade that led to the death of every superhero in his world. Following the speech Sir James attended an exclusive party where he thanked Sebastian Shaw of the Hellfire Club for his generous contributions to the campaign and was introduced to Henry Peter Gyrich. He informed Gyrich that Sebastian should drag him down to the Club next time he was in town, before moving on to other discussions. At one point during the proceedings he ended up with a glass of white wine in his hand; since he only liked red wine he altered reality to change this. And in Otherworld Merlyn and Roma observed this, Merlyn commenting "And so it begins..."
Later that night the crimelord Vixen who secretly controlled the government agency S.T.R.I.K.E. received a phone call from Jaspers, informing her that within a week they would receive the order to eradicate all superhumans. 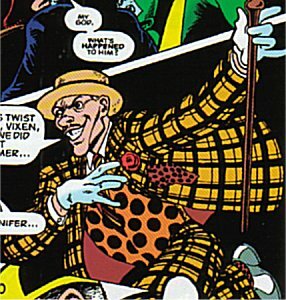 (The Daredevils#10) - Cobweb of the Special Executive had a nightmare vision of the impending future, and saw Jaspers, "the crooked man", his face looming over a twisted world full of corpses. (The Mighty World of Marvel featuring the Daredevils#7 (fb) - BTS) - Instigated by Jaspers, Britain became a police state, with "Beetle"-armoured S.T.R.I.K.E. agents rounding up anyone with even the slightest degree of superhuman powers, and incarcerating them in concentration camps. Jaspers' face was plastered on bill boards, next to the message "In your hearts, you know he's right!" (The Mighty World of Marvel#8) - Jaspers became the Prime Minister, winning in an election landslide. Feeling that he had gone too far, Vixen and two of her men broke into Number 10, Downing Street to confront him, but they found him in an office where reality held no sway. While Jaspers danced around in an ever changing array of hats, both of Vixen's men suffered horrendous transformations. Jaspers then turned Vixen into a small fox, a vixen in form as well as name. (The Mighty World of Marvel#9) - Jaspers let his reality warp spread across the country and presumably the world. 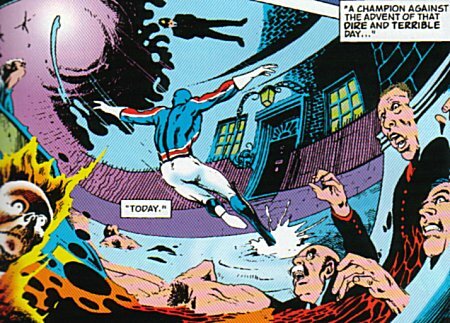 As reality was replaced with nightmare (the Jaspers Warp), Captain Britain raced to Downing Street to face Jaspers, with Merlyn watching and commenting that the Jaspers of Earth-238 "could at least be halted, even if it meant destroying his entire continuum. This one is not so easily containable...and if he cannot be defeated, then the Omniverse shall fall into Chaos...and a new and hostile God shall play dice with matter." 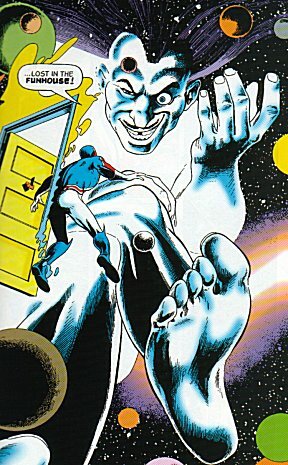 Captain Britain entered Jaspers' office to find Jaspers a giant at one with the universe. 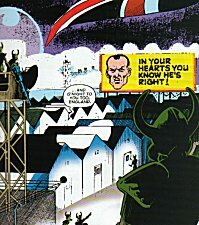 (The Mighty World of Marvel#9) - A gigantic Jaspers watched over the hell he had turned London into. Simultaneously the giant held Captain Britain up, no bigger than an insect in comparison. He subjected the hero to a barrage of false memories, first of still being on Earth-238, then of being a much younger man awakening in a hospital bed to find he was not a superhero and that he was married to Courtney Ross, his girlfriend from University. But these were illusions, that departed when Jaspers bored of them. Jaspers droppd the Captain and returned to normal size. He turned his back on the hero who viciously attacked him, trying to beat him to death. But he found that all he was hitting was a straw man, as reality shifted and Jaspers went through a variety of transformations, amongst them the Devil and the Grim Reaper. He put Captain Britain through a combine harvester, literally, then walked away leaving him for dead. As the Captain struggled to his feet to continue the fight, the Fury approached. (The Mighty World of Marvel#10) - Feeling lonely Jaspers created the Crazy Gang out of the earth itself. While introducing himself to his new friends, he spotted the Fury battling Captain Britain. Not recognising the killer cybiote, he went over to it to ask it what it was. He was struck first by a strange sense of deja-vu, feeling they had met before, then by the cybiote's destructive energy blast, as it concluded that this Jaspers was not the same Jaspers that had created it and programmed it to leave him alone out of all the superhumans it encountered. It fried him, leaving only a smoking corpse. But the flesh swiftly crept back over Jaspers' bones, and he became a muscular boxer, with the Fury being turned into a giant ball for him to hit. The Fury, with its supreme ability to adapt to any situation and the experience it had gained from its recent dimensional jaunt, survived, and a bizarre battle commenced as each combatant switched from form to form in an attempt to gain the upper hand. (The Mighty World of Marvel#11) - The battle continued, and the two fighters began jumping to new locations, each one increasingly deadly, their bodies warping as they went, trying to kill one another. Eventually the Fury used its dimension travelling capabilities to take them both to Un-Space, the empty void between the dimensions. With no clay for his mind to play with, Jaspers reverted to his original human form. The Fury extended a filament through his cranium from one hand to the other, and then incinerated his brain, killing him. It then returned with his corpse to Earth-616. (The Mighty World of Marvel#12) - Saturnyne used the threat of activating a Jaspers clone to convince her replacement as Omniversal Majestrix to restore her to power. Watching from Otherworld, Roma informed the two Captains that she had killed the cell scrapings, making cloning impossible. (Uncanny X-Men#462) - As the disruptive energy wave from the "House of M" reality warp washed across Otherworld, causing chaos and a temporary breakdown between inter-dimensional barriers (causing beings from multiple realities to briefly appear on Otherworld), one side effect was that Mad Jim Jaspers returned to life (see comments), coalescing first as energy and then regaining corporeal form. He commented that he both minded having been dead, and the dashed length of time it had taken to come back. Noting the strange beings around him, he spotted Roma, the Omniversal Guardian, trapped beneath a fallen pillar. Somehow recognising her as the area's ruler, he commented it was time for her to go, but before he could inflict injury, he was surprised to see his left arm transform into an energy cannon, which he recognised as being like the creature which had killed him. As the transformation spread further, he recalled the manner of his death, before pointing his gun arm at the pinned Roma. He introduced himself to the newly wakened woman as "James Jaspers, Prime Minister of England and Overlord of the Omniverse." Before he could fire, he was struck by an unexpected blow from Captain Britain, who had raced up unnoticed, and Jaspers was sent flying into the distance. (X-Men: Die by the Sword#1) - Fury infected Jaspers was approached by Merlyn, who offered to be his partner against Roma and Captain Britain (Brian Braddock). During their conversation three Corps members attacked and Jaspers transformed them into Fury copies. (X-Men: Die by the Sword#2) - Jaspers and his Fury copies watched the coming of more Corps members. (X-Men: Die by the Sword#3) - Jaspers and the Fury copies easily fought back the Corps and several of them were transformed by Jaspers into more Fury copies. His attempt to transform Captain UK was thwarted by other Corps members, who weren't so lucky. 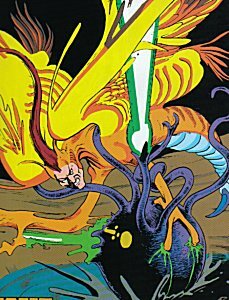 Eventually Jaspers was shot by Saturnyne with a specialized gun that should split his psyche from the Fury's, but she was interrupted by Fury copies before she could succeed. Jaspers reformed his body and realized that something was wrong with his mind, but before he could investigate he was attacked by the Exiles (Blink, Mimic, Sabretooth, Thunderbird). (X-Men: Die by the Sword#4) - Jaspers overpowered the Exiles, but they were saved by Albion. During Jaspers fight with Albion, he transformed into the Fury, loosing control over his own body. He helplessly watched as the Fury absorbed the life forces of most present Corps members to complete the transformation. (X-Men: Die by the Sword#5 - BTS) - Jaspers continued to struggle against Fury's control, which weakened the cybiote during his fight against Captain Britain (Braddock) and Albion. The Fury was eventually blown up by Blink, seemingly destroying Jaspers along with the cybiote. 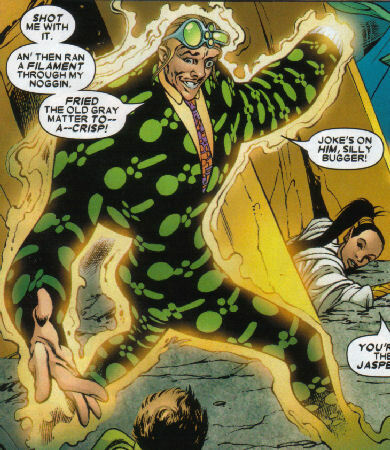 Jaspers is, in my opinion, the ultimate villain in what is the best story Marvel has ever produced. You keep meeting villains we get told are capable of destroying the world or having ultimate power, but except for Jaspers, you just don't feel those statements are anything more than hot air. A lot of his impact comes from the excellent art of Alan Davis, as he shows the effects of the devastating Jaspers Warp on the world around it, with buildings twisting in the sky and bodies distorting or bursting into flames. It was revealed in The Mighty World of Marvel #13 that Merlyn had deliberately allowed Linda McQuillan, Captain U.K., to escape her own world so that she would act as a lure to draw the Fury to Earth 616 and eventually to a confrontation with this version of Jaspers. Apparently he felt that only the creation of one Jaspers could possibly kill this other, more deadly version. The summary of Uncanny X-Men#200 is adapted from the summary given by Nicholas Giard. However, at the end of his summary, he mentions that the story precedes the Jaspers Warp stories (Daredevils#7 - Mighty World of Marvel#11). However, there are a few problems with the chronology. (1) MWoM#12 came out in May, 1984--roughly 18 months before UXM#200 and 28 months before UXM#210, the start of the Mutant Massacre. By the time of the Mutant Massacre, Betsy Braddock, Psylocke was with the X-Men. When she had joined, she had already been beaten to a pulp by Slaymaster, which is what blinded her (http://www.marvunapp.com/Appendix/slaymast.htm). Betsy got robot eyes to see, from Mojo. Captain Britain II#13, where Psylocke gets blinded, occurs after MWoM#12. (Uncanny X-Men#200) - During the trial of Magneto , Sir James Jaspers proved himself to be a rabid anti-mutant prosecutor who wanted Magneto to be punished for his crimes: Regardless of his age and his being reduced to infancy and restored to adulthood he did commit all those crimes in his lifetime. At the trial, Admiral Suvorov testified that Magneto did sink a nuclear submarine that he had lauched in retaliation for Magneto's threatening the world. Magneto explained that he was acting in self-preservation and the enraged Jaspers screamed that Magneto was holding the world hostage and was sternly asked by President Devereux to be quiet : this is a court of justice, after all. Fenris, the children of Baron Wolfgang von Strucker, interrupted the trial, seeking vengeance on Magneto for his past conflicts with their father. While Fenris are concentrating on Magneto, Xavier jumped between them from behind, separating them. They needed physical contact for their powers to work, and were now helpless. Jasper took opportunity of the situation, and attempted to hit Andrea Strucker on the head with a piece of rock, yet Magneto stopped him. Xavier had a seizure and in the distraction the twins touch hands again. They blew a hole to the river, and vanished in a the flood that comes in. Following the battle, Magneto left the court, refusing to accept its judgement any longer. (X-Men vs the Avengers#4) - Magneto surrendered to the Avengers and again stood trial at the International Court of Justice. Sir James Jaspers again served as chief prosecutor. He questioned Suvorov again, reviewing Magneto's sinking of the nuclear submarine. He next questioned Captain America, asking him if he believed that Magneto had changed his ways--to which Captain America replied "No." Ultimately, Magneto was judged to be afforded the same rights and privileges as any other warring state. He was exonerated of crime in the International Court, but judged to still have to stand trial under individual nations whose laws he broke. Jaspers' resurrection might be like many of the other individuals on Earth-616 revived when its timeline was replaced by the House of M one, brought back because the circumstances which caused their deaths in 616 never happened in the new timeline. However, given that he wasn't on Earth-616 at the time, and that Captain Britain and Meggan weren't affected by the rewritten timeline until they later went to Earth-616, this may not be the full story. It's also worth considering that his apparently becoming an amalgam of himself and the Fury may be down to the Fury "infecting" him in the way it did Sidney Crumb. Jim Jaspers seems to be based on the British comedian Terry Thomas. Oooh, big can of worms... Now as most people know, Alan fell out with Marvel over the reprinting of Doctor Who strips in the US Doctor Who editions. Marvel didn't have a reprint royalties set up and Alan wasn't happy about this. With the rift there and widening, Chris Claremont, who was unaware of the political problems brewing, introduced Sir James Jaspers into Uncanny X-Men#200. His intention was to slowly have the character infiltrate and eventually have a Jaspers' Warp in this reality (wasn't it retconned out of regular existence by Alan Davis? I can't remember) with the X-teams as the main thrust in the line-spanning story. Alan went (so I've been told) ballistic over the Jaspers appearance and effectively severed any chance of a reconcilliation. Now, this is where I get a bit hazy for a while because while I know what I was told, I'm not sure about the legal implications: there is apparently a glaring difference between US and UK copyright laws and Marvel's lawyers allegedlyrecommended to Marvel that they basically ignore Moore's creations and story ideas. The legalise would eventually cost Marvel a lot of money and wasted time and the upshot was they dumped the X-Men: Jaspers' Warp idea. Romita also said that there would be hints and beginnings of subplots in many of the other Marvel comics, I was out of the loop at the time, but perhaps others noticed odd things happening in their Marvels during 1986. I have also heard that Marvel insisted on a reference to the Jaspers Warp in a post Moore Captain Britain (I think this was Mike Collins' Sid's Story) and there was also a mention (retconning?) of the Jaspers' Warp in an early issue of Excalibur (Kylun?) - sorry it's been ages since I read them and there all in the other loft. As mentioned below, the Jaspers Warp is responsible for the creation of the Warpies--Snood. Then Claremont became privy to all the politicking and immediately rewrote his impending blockbuster and subsequently what Romita hinted might have been the equivelant of a Marvel Crisis (hot on the heels of the real one) was laid to rest. Now, in 1990ish, while I was starting to put what was never my fourth issue of Mutant Media together, I stumbled across a lot of stuff about Claremont's and Marvel's plans. I was putting together a column called something along the lines of Hypotheticals: What might have happened in Alan Moore's Marvel Universe. Corrin probably has a better memory than me, I haven't got an issue to hand, but we did toy with the concept in issue#3 I think. Romita was leaving the book, so Alan Davis was asked to do it. He declined because of the restrictions that were becoming apparent even this early. He also didn't really want the gig at the time. The Mutant Massacre was to have been commited solely by the Nimrod/Fury hybrid. He is eventually only stopped by Kitty phasing through him and disrupting his circuits. However, Kitty, Nightcrawler, Colossus AND a new character Longshot, were to have been relocated to Muir Island to work with Captain Britain and his teamand for medical attention. Kitty was always going to be critically injured, as was Nightcrawler. Colossus was sent as protection and as a perfect foil for Brian Braddock, who Kitty would develop a crush on. Mutants, good bad or indifferent began flocking to Xavier's and with Phoenix (Rachel Summers) conveniently out of the way and Kitty and Braddock in Scotland, there were no members to see the parallels with Days of Future Past or with the Jaspers' Warp. America was in the thralls (throes ) of mutant hysteria and Magneto now in charge of the X-Men has to make some decisions that effect the status quo. Allegiances are formed with villains and new players, such as Mr Sinister and others were becoming prominent mutants through their covert ways. The UN decrees that mutants are a menace and Jaspers meets Nimrod and subsequently becomes aware he too is a mutant and a pretty powerful one. Unlike the Jaspers' Warp, these two become allies, or at least that is what Jaspers' thinks. With reality falling apart and Nimrod culling mutants, Forge is drawn into battle and what happened in Fall of the Mutants is essentially what was written, except the big fight scene was different and the denouement was different. Instead of being impervious to detection, the mutants who ventured into the Seige Perilous were returned but with the warps they had undergone (some of this was used in Inferno as well, proving that writers who can't use something here will use it there). The X-Men was going to be a much darker comic and Excalibur the light side. X-Factor and New Mutants would essentially begin to pick up the pieces and rebuild mutant/human relations. That info on the Mutant Massacre is great! I had no idea. It would have been much better, I think. Man, would I love to see Moore set the Fury on Earth-616's heroes--maybe a What If/Elseworlds story? Like Peter David's Last Avengers Story! Too bad Moore has no interest in working for Marvel, or doing that sort of story...--Snood. any other character whose name starts with "Mad". The Jaspers Warp - The Jaspers Warp was a period of reality instability which gripped Britain and possibly the entire world during the period Jaspers was Prime Minister. During this time reality became increasingly unstable, with people mutating or catching fire or floating off into the sky, while buildings twisted and turned around them. Nothing remained to anchor people to sanity, and many children in the womb around this time would later be born as Warpies, bizarre mutated creatures. As Jaspers' power grew, so the Warp spread. The Jaspers of Earth 238 managed to spread his warp to engulf the Earth and beyond, out into space, and it was predicted that if he went unchecked it would spread out to contaminate his entire universe and possibly beyond: he was only stopped by the total destruction of his universe. The Jaspers of Earth 616 was more powerful than his counterpart, and Merlyn stated that even destroying his universe would not stop him.